A facial scrub & mask unifies the skin tone & reduces the appearance of blemishes, lightens and smoothens the skin. Cut, file, shape and color your nails with a manicure & pedicure. Shape your eyebrows and remove unwanted facial hair with threading. 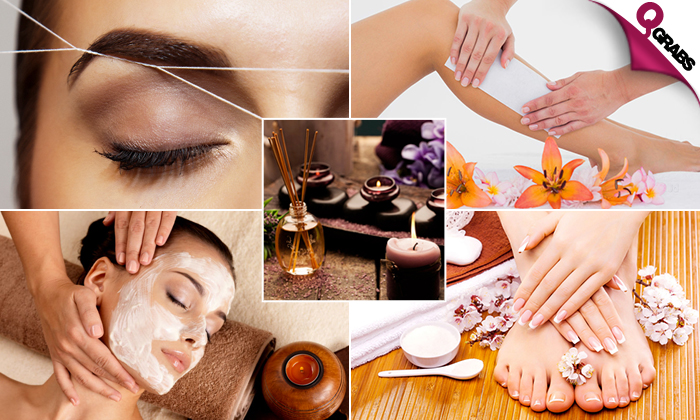 The use of aromatherapy with scents and aromas released from candles, oils and other products stimulate the client further, heightening their sense of relaxation and wellness. Hot oil hair treatment is used to stimulate blood flow, helping with hair growth providing many benefits to help deal with common hair care and styling issues such as dandruff, dry scalp, frizziness and much more. Basic facial promotes an even look, imparts hydration creating a natural dewy glow gently exfoliating, reducing the effects environmental stress, appearance of fine lines and wrinkles creating softer and smoother skin giving a tighter look. For the facial we use a wide range of products depending on each skin needs and type, like bio skincare/Royal Beauty for cleanser, vizo scrubs, Royal Beauty mask, vizo/vlcc moisturizing cream. Dip your hands in paraffin which helps retain the oils that your body naturally produces; it maintain healthy skin, heal dry and cracked hands and feet, opens pores and removes dead skin cells. Finish off with a hair wash, dry, shape your eyebrows and remove unwanted facial hair. Up to 84% off so much love & pampering! Meaad Beauty Center newly opened in Muaither provides all the beauty and spa services in a beautiful ambience with style and comfort. Their well trained experienced therapists will know the best treatment for you and give you the finest care and result of your expectation. As the name Meaad means “Promised”, we promise you the experience you will come back to.